When you log in to crowdtangle.com, the view you come to is Dashboards, which is the tool’s section for monitoring social media accounts/pages, intelligence and statistics. 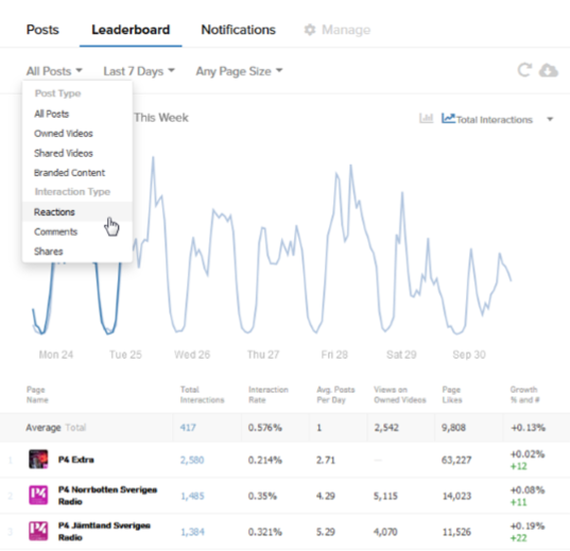 One Dashboard does not cover all platforms, which means that you need to create a Dashboard for Facebook, another one for Instagram and one for Twitter (or more than one if you need to). 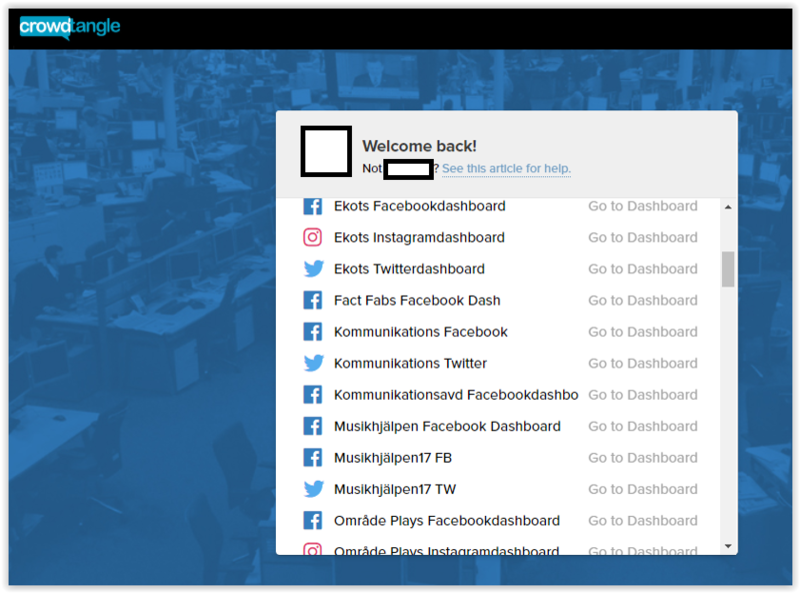 When you log in to CrowdTangle (the Log in button is in the top right corner of the screen), the first window you come to is Dashboards. Click on "Go to Dashboard". In Dashboards, you can create lists, for example to monitor Facebook pages/groups in a geographical area, or concerning a specific topic/area of interest. Many newsrooms/departments have their competitors in their lists to see what their audience is currently interacting most with (e.g., sorted by the highest number of interactions in the last 72 hours). In your Facebook Dashboard, you first choose whether the list is to cover pages or groups (only open groups). A local newsroom might search for groups with connections to particular cities or towns in the coverage area for example (and get search results such as What’s happening in X, We residents of X or Police cars in pursuit in X) and thus identify potential news items from what is written in the groups (the information must of course be fact-checked and sources reviewed critically). You now give the list a name and search for the pages/groups that you want to add to your list (the Search box is marked in red below). Next to each item in the search results is a +, which you can click on to add the page/group to your list. You can also set the time period you want the list to display (two hours, 24 hours, 30 days, etc. ), and you can sort by the content of posts (image, video, link posts and text posts). Displaying your list in Leaderboard mode allows you to rank pages/groups in various ways to get the statistics you want (for example, if you want to compare your own page/account with those of competitors), for example by selecting only comments or only shares. If you are covering a particular event, it might be interesting and useful to have a flow in which everyone writing about the event is captured. In CrowdTangle you can do searches in much the same way as you do in TweetDeck or directly in Twitter. 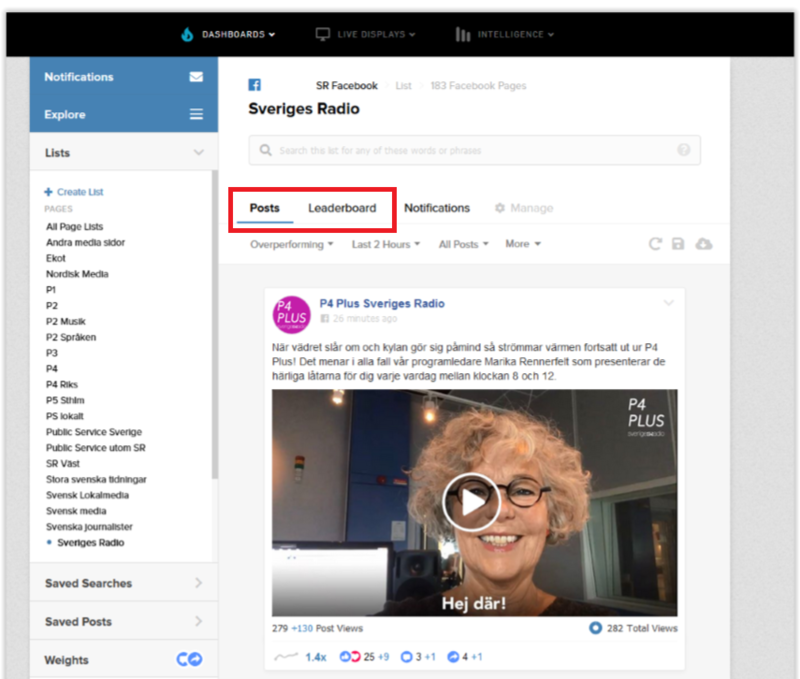 For example, you can search for P3Guld,#P3Guld,"P3 Guld" (comma between keywords/search terms) to bring up all open Facebook pages writing about P3 Guld (Swedish Radio's music awards for a younger audience). Click on the Saved Searches tab and select New Search. Searches can then be sorted and filtered in much the same way as lists in CrowdTangle. 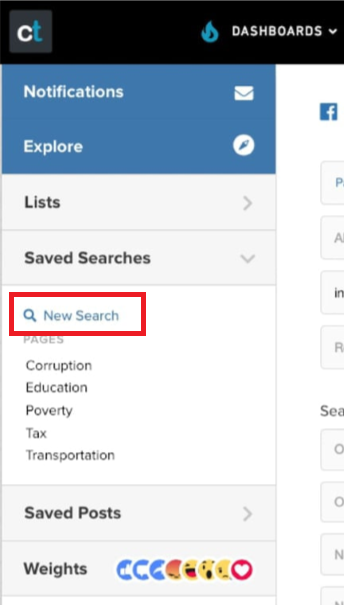 Once you have your list of search results, you can also filter the results further under the Edit Search tab, for example to remove keywords from your search results if your search ended up generating too many results, or by setting the language to narrow down the search results further.